Victor Design Blog: Going to Cambodia! One of my best pals, Chad Phillips, is a missionary in Cambodia. He and his family have been working working at Good News Baptist Church in Phnom Penh for almost 2 years now, and it is amazing to see how the Lord has blessed their ministry. I have often thought about trying to go and visit, and Chad and I had even mentioned the idea a few times, but no serious plans were ever made. That is - until the past couple of months! About 5 weeks ago, I got a call from Chad telling me about some adjustments they were making to their furlough plans. They had an exciting ministry opportunity that would be coming about next summer, so they were going to reschedule their trip home before that date. Chad also began telling me about a project he wanted to do before he came home, and he wanted me to help him out. He was wanting to make a short video to kind of show his life and ministry there in Cambodia during their first term. Somehow in a few minutes he had talked me into trying to get to Cambodia ASAP and get this done. Well, we worked out the details. I got my Passport and Plane tickets (which include 20 hours in the air, ughh! ), I cleared my calendar during Thanksgiving (Turkey diet), and very soon I will be heading to Cambodia. I am very excited about this opportunity, and humbled as well. Six weeks ago I never would have imagined that this would be possible. Please pray that the Lord would help me and protect me on this trip and that He will bless the work we do. As we began to see the details come together that I would be able to go to Cambodia, I decided that I wanted to do a fundraiser to help pay for my trip and project. Chad was already working on some new things including a new website. I thought what better way to do a Cambodia trip fundraiser than to create a promotional packet to help promote this. 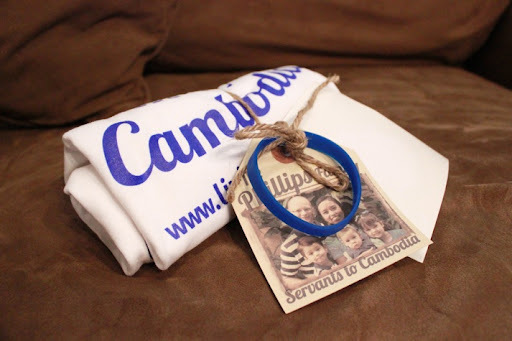 Over the past few weeks I have ordered and created a few items and put them together into a cool Cambodia packet. I got a Pray for Cambodia T-Shirt made complete with Chad’s new website on it. There is also a wristband with the new website on it. I made a vinyl decal that you can put on your car or mirror to help you remember Cambodia. And finally, I made a tag to go along with the package. It has a picture of the Phillips family and some other info. What’s awesome is that my family members put all of these items together for me in a cool looking bundle! Check it out. If you would like to see more pics or even order one of these Cambodia Packages, check out my website Here. Lastly today, I wanted to mention Chad’s new website. It is not complete yet, but you can check it out at www.living-fields.com. The name he chose for his website is very significant. A quick Google search of Cambodia will show you why. Probably the most notable event in their recent history is the brutal Khmer Rouge regime which ruled from 1975 to 1979. Thousands were murdered and even more died of disease and starvation. There are several burial sites within Cambodia that are simply know as “The Killing Fields.” While this is just a history lesson to most people, it is still very real in the minds of most Cambodians, including Chad and Linda’s family members. The things associated with “The Killing Fields” makes the name of Chad’s new website overwhelmingly powerful. The darkness and death that came in Cambodia’s past will give way to the light and life that the Gospel brings to the Cambodian people. With Christ and laborers like my pal Chad, the future of Cambodia is “The Living Fields”. Awesome idea! I will be praying for you!